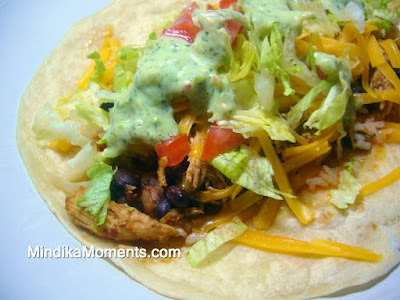 Mindika Moments: My Cafe Rio substitute! If you live in Utah, or the surrounding states, then you've definitely indulged in Cafe Rio! Most of us here in Utah love our Cafe Rio. Well this recipe is my version of Cafe Rio. A while back I decided that I better come up with something comparable to make at home, or Cafe Rio would soon bankrupt me. Of course I love Bajio too...I'm still trying to crack the recipe for their chicken and sweet green chili. If anyone has something close...please share! 1. Add to the prepared Italian dressing, lime juice, cumin, chili powder, garlic, salt and pepper. Mix well. 2. Place the chicken in a crock pot. Pour the prepared sauce over the chicken and cook on low 3-4 hours or until chicken is done. 3. Remove the chicken from the crock pot and shred. 4. Place the shredded chicken back in the crock pot with the juice and allow to cook for an additional 30-60 minutes. 5. About an hour before the chicken will be done, mix together the beans and tomatoes in a medium sauce pan. Bring to a boil, reduce heat, and allow to simmer for about 45-60 minutes. 6. In a separate sauce pan mix the water, onions, lime juice, cilantro and salt. Bring to a boil. 7. Add the rice and cook for 20 minutes. Remove from the heat and fluff. 8. Assemble the burritos by putting rice, beans, chicken, cheese, sour cream, olives and guacamole into each tortilla. Wrap and enjoy. This looks delicious! I live way on the other side of the US - so I have never experienced Cafe Rio...looks like I'm missing something! We are on the Cafe Rio train! I just made/tweaked a version of the pork barbacoa and will post that soon... Yum! Mindi...This looks good I'm going to try it....do you have the green dressing recipe you used? I crave Cafe Rio too! I'll have to try this at home! Cody, the green dressing I use is just Hidden Valley Ranch dressing mix, made according to the package instructions, using sour cream instead of mayo and then I blend in a hand full of cilantro and 1 tomatillo. I don't know if its anything close to Cafe Rio but we think it tastes pretty good.